First impression: A light, fun read! Gemma can’t believe her luck when the star football player starts flirting with her. Max is totally swoon-worthy, and even gets her quirky sense of humor. So when he asks out her so-called best friend Addison, Gemma’s heartbroken.Then Addison pressures Gemma to join the date with one of Max’s friends. But the more time they all spend together, the harder Gemma falls for Max. She can’t help thinking that Max likes her back—it’s just too bad he’s already dating Addison. How can Gemma get the guy she wants without going after her best friend’s boyfriend? The One That I Want was EXACTLY what I needed to get out of my reading funk. For the past few weeks I've been falling behind in my reading. When I picked up this book, that instantly changed. The One That I Want was the light, easy read that I didn't know I was missing. Once I started it, I could not put it down. I adored Gemma's character, and saw so much of myself in her. Jennifer Echols crafted such a great character in her! 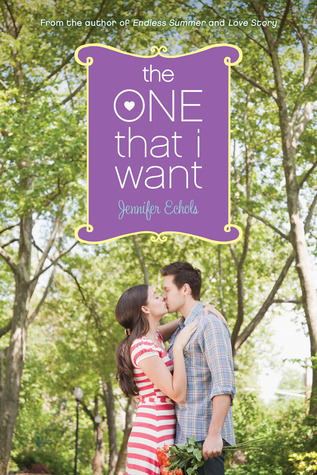 I have only read one other book by Jennifer Echols previous to this, Love Story and I absolutely loved that one. I went into this one with high expectations and was not dissapointed one bit. The characters, the storyline and everything in between was perfect. Thank you, Jennifer for pulling me out of my reading funk and giving me a great reading experience! Last impression: Grab this book and hit the beach(or deck). Perfect for some fun in the sun!